While our minister is on long-service leave, we are being ministered to by Rev. John Mercer. He and his wife Phyllis are staying at the Manse and will be available on the regular contact numbers. 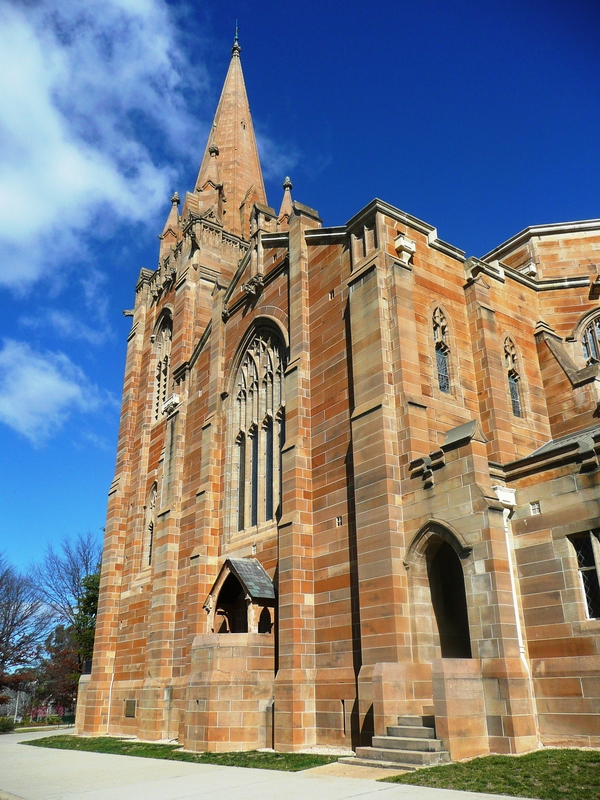 The Mercers have worked in Aboriginal missions in the Gulf region of northern Australia, with the Home Missions board in Victoria and in parish ministry in each of the eastern states, including a stint at St. Andrew’s Canberra (pictured). Since John’s retirement from full-time ministry around 20 years ago, the have split their time between their home on Mount Tambourine in Queensland and supply preaching, particularly seeking to make it possible for ministers to take their leave, but also preaching in vacant parishes. John supplied the pulpit at Benalla in 2004 and 2005 while Rev. McDonald was Interim Moderator and has recently completed his second 3-month stint at Wangaratta. John and Phyllis make a point of visiting all of the parishioners wherever they are, so you can expect a visit sometime before Neil & Jenny return in mid-April (assuming you haven’t already had one). Note: Due to a couple of technical problems the regular sermon recordings have not been possible the last 2 weeks, but this week’s sermon will be available soon as well as one of John’s wonderful childrens’ talks based on his missionary service in northern Australia. Between opening presents and Christmas dinner, a church service is often part of the plan. We plan to make you welcome, whether you are on holidays, visiting family or a regular member of the congregation. Our Christmas service is at 9am Christmas morning. Services on the Sunday following Christmas are at the normal times, 9am at the Rutherglen Community Centre and at 11am in 59 Mitchell Street, Wodonga. This Sunday will be unlike many that have come before. Our minister will be absent from the parish in his role as Moderator of the Seymour-Nagambie-Yea parish and will be preaching at Yea and Seymour as the Session there ordains a new elder. In his absence, members of the congregation will be conducting the service at Wodonga. Preaching is a challenge and a great responsibility. To discern the message of the text and then convey it in an understandable without taming it down is hard to do. That said, the message of the Bible is simple enough for it to be understood by the first time reader. No man knows anything about higher mathematics until he can explain it clearly to the man on the street. Jules Henri Poincaré. Martin Luther, a university professor, said that he did not consider he had done his job unless he preached so that the children in his congregation could understand the message. 1. It always is attended by a consciousness of the presence of God. 2. There is no problem of holding the attention of the people. 3. Even children can understand it. 4. It is preaching that results in a change in those who listen. May the these each be present in the preaching this and every Sunday! It has been my pleasure to preach at Wodonga on one occasion and I will be remembering Alan and Michael as they fill the pulpit this Lord’s Day. Please pay close attention to the Word and encourage those who bring it to you. With a visit from the Moderator of the General Assembly of the Presbyterian Church of Victoria, Rev Douglas Robertson, at the service in Wodonga and the meeting of the General Assembly of the Presbyterian Church of Victoria in Ballarat in just under a fortnight, I thought it would be a good time to think about the way the church is run. (You can read about Douglas’ other visits on his blog moderator08.wordpress.com). Some churches believe that the ultimate expression of the church is the local congregation, so they vest all the power of decisionmaking with the local congregation. We call this Congregational church government. Other churches believe that the ultimate expression of the church is the collection of all congregations under one head. In these cases, some decisions may be made by the local congregation, but the big concerns are decided by a bishop, archbishop, Pope or Patriarch. We call this Episcopal church government. Presbyterianism is a system of church government, more so than a kind of theology, although the two usually go hand-in-hand. In Presbyterianism decisions are taken by elders or people whom the elders entrust with decision-making. In the local congregation, elders usually give responsibility for the buildings and physical needs of the congregation to a committee elected by the congregation. At the Presbytery and Assembly level committees are also appointed to investigate options, recommend actions and to carry out the decisions of the Presbytery or Assembly. These “courts” are not more important the higher you go, rather they are different courts that oversee different responsibilities shared by every congregation and coordinated at the most effective level. In the 19th century the Moderator of the NSW Assembly used to chair the Assembly then get on his horse and go home, and that’s the sort of role I think it ought to be. The word Moderator means chairman. Yet the role seems to have become a year-long position requiring attendances as a figurehead and I think many Ministers have refused nomination in the recent past because of this ‘other role’ not specifically commanded by the Assembly. The Presbyterian Pulse July 2009, page 7. I recommend the Wikipedia article on Presbyterian polity, which I had a large hand in rewriting. A very valuable resource is the Introduction to the Presbyterian Church of Australia (or pdf), published by the General Assembly of Australia Code Committee in 2004. It outlines in better detail how the different parts of the church are meant to operate. You can also read the Presbyterian Form of Church Government drawn up by the Westminster Assembly between 1643 and 1649. For a detailed list of regulations showing how the church runs, see the Presbyterian Church of Victoria Code and the Presbyterian Church of Australia Code.